Heptonstall Social and Bowling Club has been running since the late 1960s, welcoming all members to benefit from our club. We offer bowling, snooker and pool to all members wishing to join, and have many of our own bowling and snooker teams. The club is open on various nights, depending on the season and what social events are being hosted. As a club, we can offer private functions such as wedding receptions, birthdays and funerals at reasonable prices. We have kitchen and bar facilities that can be used for your own individual requirements, and a stage big enough for live acts, bands and DJs. The club is used for regular events throughout the year, which are suitable for all ages, including: playgroups, sequence dancing, exercise classes, and worship. Each year we hold our own events, such as: Burns’ Supper, the local pantomime in November, Heptonstall’s Got Talent, New Year Eve free party, our famous Bonfire Night, and the Heptonstall Village Team Xmas Lunch for our older residents. There are other events in between, according to the time of year. The club has a new website site, which can be accessed via this link. Monday 7 September 2015 commencing at 7.30 p.m.
Minutes for the 3 August 2015 meeting can be seen here. The Ceilidh at the Bowling Club, with local band Three Men and a Box, is less than a fortnight away on Saturday, 7 March, from 6.30pm. The band appeared at the Heptonstall Festival last September and at the Burns Supper Night last month. Justin, Mark and Daz came together last year to form the band. They play a wide selection of music from Reggae, folk and their own compositions. 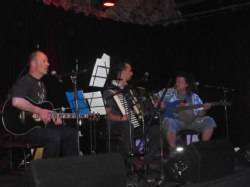 Mark plays guitars, Daz plays bass and Justin plays piano accordion. Mark has played with other bands over the years as has Daz who currently plays in a number of different bands. Justin has played with mostly Scottish ceilidh bands over the years and still competes at national level. Everyone of all ages is welcome, with or without children. The lights will go down and the music will turn up a notch from 9pm. Don’t worry if you’ve never tried ceilidh dancing before, the band have secured the services of a ‘caller’ for this night, so those of you who want to take a turn on the dance floor, bring your dancing shoes! Tickets will be £5 (children free) and there will also be a good value supper food, home-made potato and meat pie, or potato, cheese and onion pie, with either baked beans or peas, for £2.50. Tickets from Tony at the Post Office, or on the night on the door. 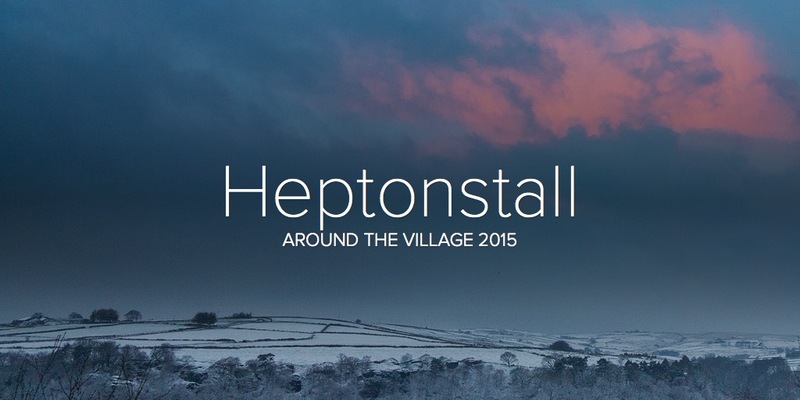 The event will benefit Heptonstall Village Team, which organises events for older members of the community. Why not dig your way out of your home on Saturday evening and dig your way down to the Social and Bowling Club in Heptonstall? We will be hosting our second Heptonstall Village Burns Supper Night, and this year, we have a lone piper, our stars from the village pantomime as well as, Francis Durning doing the formal address to the Haggis as well as live music from 3 men and a box. 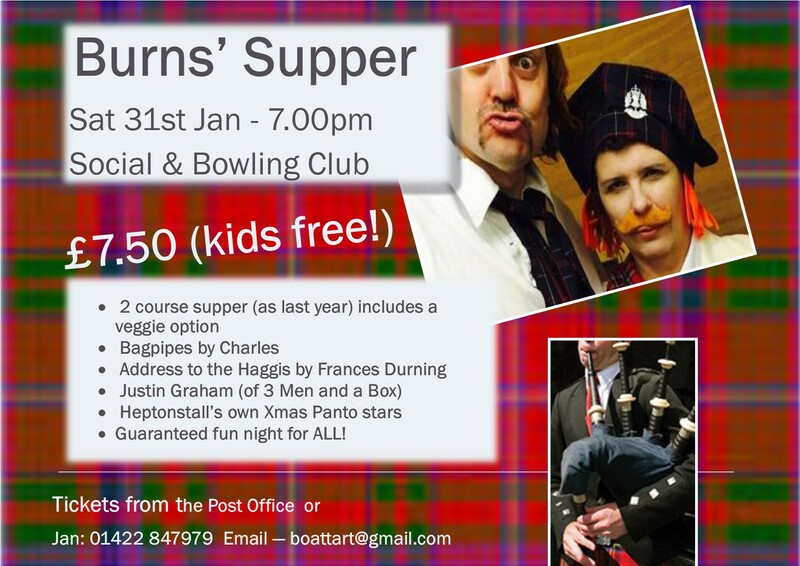 This will be the first of a series of family/ dance/ fun events to be held at the Social and Bowling Club. The aim is to provide some high class, low cost occasions for ALL people of ALL ages,, with or without children, from Heptonstall and beyond. A simple supper will be available to buy for £2.50 at each of the events. We’ll be starting with home-made potato and meat pie, or potato, cheese and onion pie, with either baked beans or peas. After 9pm, we’ll turn the music up and the lights down so we can all dance and boogie the night away. This time the band will be three local lads, Three Men and a Box – you may remember them from last year’s Heptonstall Festival. Next time it will be DJ Dapper Dan and his 30’s, 40’s and 50’s Tea Dance style music. If you are aware of any music or bands you think will go down well, please contact Gail King on 07826 525366.